Reach 15000 points to complete the level. This the first level of Salty Canyon episode that have one new material which is bomb that can blast after selected moves. This candy board have 32 meringue blocks and four bombs are in between. First you should try to break meringue blocks and then break bomb by combing with normal candies or with striped candy or any other special candies. You have just 15 moves so don’t waste move and try to use move in breaking bombs. 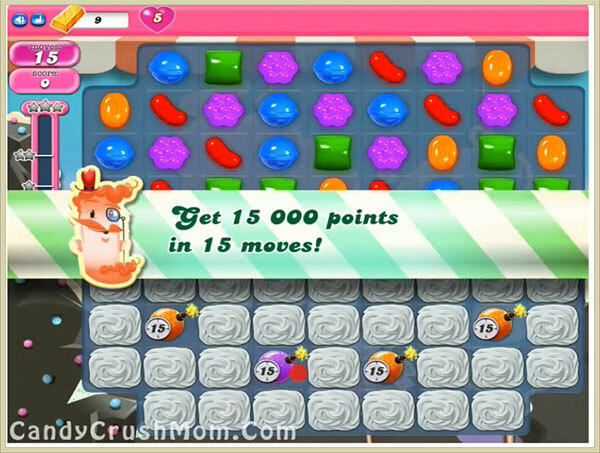 We completed this level with 23940 score within last remaining moves by play more on bottom and striped candy to break bombs. I’m on this one and it says you get 15 moves, but it only gives me 10 and then goes out to ‘you didn’t pass this level’ and I have to start over. I have yet to be able to use 15 moves – HELP!!! Same thing happens to me. Bombs say 10 and 10 moves is all I get. The main screen says 15 but at 5moves to go the bombs go off level over and failed! Reading things online say you need to update app, or it doesnt happen on facebook page. Yes, yes it does. I have FACEBOOK on a laptop with google chrome playing candy crush and the computer 4 months old. Windows 10. No updates, no apps and I am on the FACEBOOK webpage. I still only get 10 moves inside the bombs but I get 15 moves. Last 5 moves are inaccessible, says I failed. SO EFFIN IRRITATED. HELP PLEASE! Thanks to a color bomb I scored over 15,000 within 8 moves and I was still told I failed and had to start over. This has happened twice. It is my belief that this is an intentional error on the game to get more people to spend money in buying extra lives, etc. I am through with candy crush.